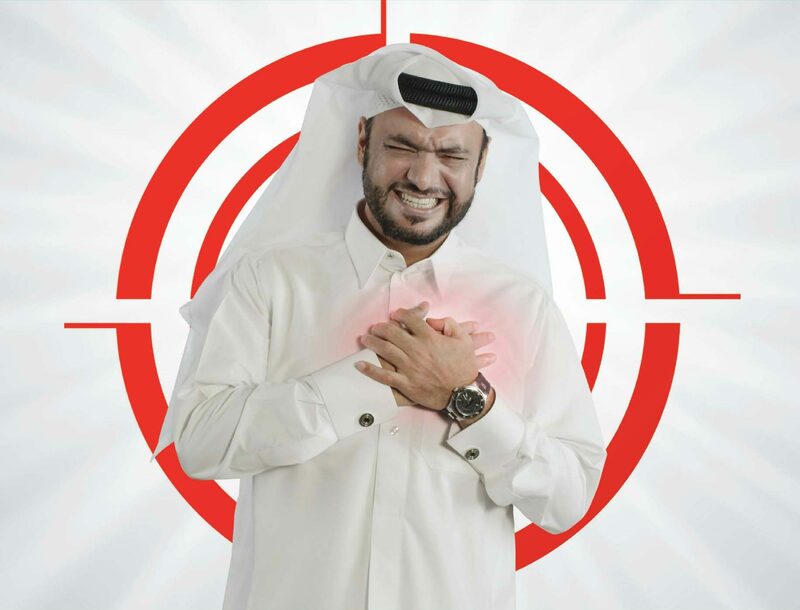 Qatar’s Hamad Medical Corp. (HMC) has launched a hard-hitting new campaign to improve awareness of some of the lesser-known signals of a heart attack. In addition to chest pain, an aching neck, shoulder, back or jaw can all be signs of an impending attack, the bilingual public campaign states. 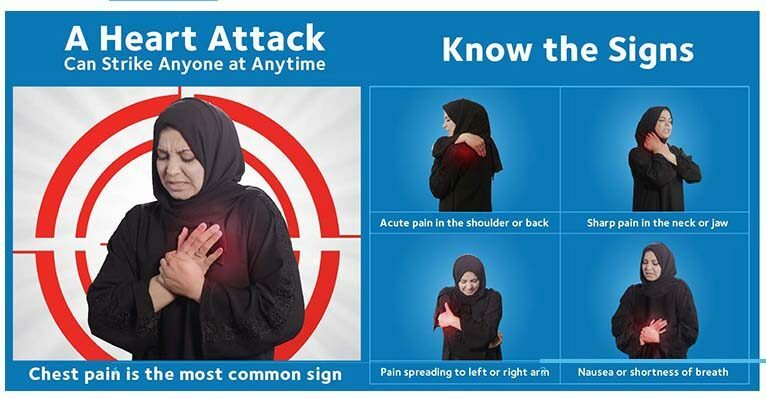 Warning that “a heart attack can strike anyone at any time,” ads for the campaign use the slogan “know the signs” alongside images of a man in a thobe and a woman in abaya and shayla to illustrate the message. The ads are part of a wider campaign to cut the number of heart attacks and strokes in the country – many of which affect young people. It also aims to improve the nation’s heart health by helping people better recognizing a heart attack and understanding what to do if they think they have a heart attack. The publicity drive will also try to encourage people to reduce their chances of having a heart attack or stroke by improving their lifestyle. In the event of a suspected heart attack, residents should call 999 immediately, the campaign says. After calling emergency services, patients should follow the first-aid advice given over the phone until an ambulance arrives. 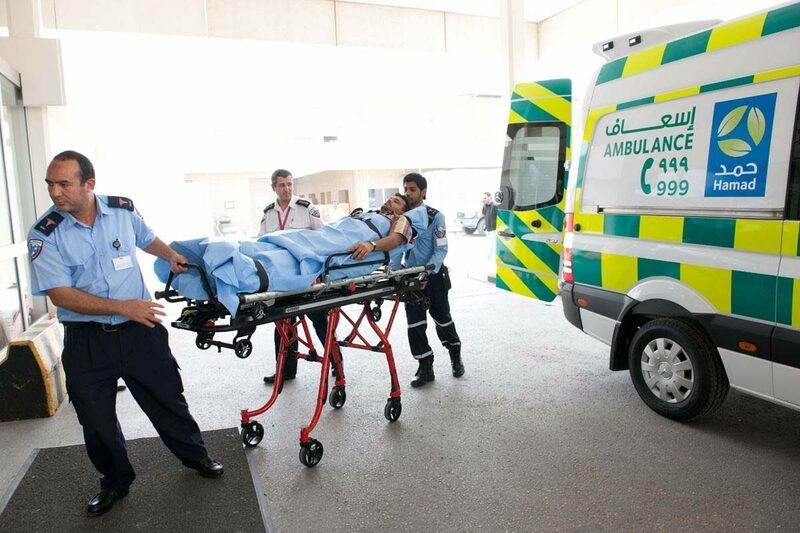 Ambulance staff will monitor a patient’s heart rate and rhythm on the way to the hospital and give this information to doctors, to enable them to take the appropriate action, Assad added. Heart-related illnesses account for around one in eight (12.99 percent) of all deaths in Qatar and last year the country’s dedicated heart hospital admitted 20,737 people for related problems, HMC said. Heart disease is now common throughout the developed world and in some countries, the rate of death as a result of heart illnesses is even higher. In the United States, heart disease accounts for around one in four of all deaths, according to the Center for Disease Control And Prevention (CDC). However, HMC statistics show that heart problems are now becoming an issue for younger people. More than a quarter (27.9 percent) of all heart patients in Qatar are under the age of 40. In addition to raising awareness of the signs of an attack, the campaign also aims to encourage people to get more exercise and eat healthier to reduce their chances of heart problems. A 2013 study by experts at Weill Cornell Medical College in Qatar (WCMC-Q and HMC found that patients who were overweight or had chronic conditions such as diabetes, high blood pressure and cholesterol were more likely to suffer heart problems. Diabetes increases the risk four-fold while high blood pressure is the second strongest preventable indicator of stroke and one of the most important factors in a heart attack. Low amounts of physical activity increased the risk of heart attack and stroke by 80 percent while smoking raises the risk two-fold, the study found. And younger people are increasingly affected. Two-thirds of all heart attack patients, and half of all stroke patients were under 55 years, while many were under 40. Some 70 percent of all patients were either overweight or obese. Public awareness campaigns to encourage people to reduce the preventative risk factors could improve the nation’s health, the study said.